The day when you’re actually holding your first book in your hands is a good one. Throw that book in a bike basket and cart it around town and you have a recipe for pure bliss. – An Urban Tote from SeaLine; 100% water proof and 100% perfect for transporting kale. – An entire bike-friendly outfit from Horny Toad, complete with the Coriander Skirt (yes, like the spice! ), the Wellfleet Shirt, and the Lean Legging, perfect for layering on a fall ride. – Two Doppios from Innate Gear, the ideal cup to throw in your bag and use either for wine on a picnic or coffee on the go, as well as a Tiffin container, to keep your winter soups warm and waiting for you post-cyclocross race. 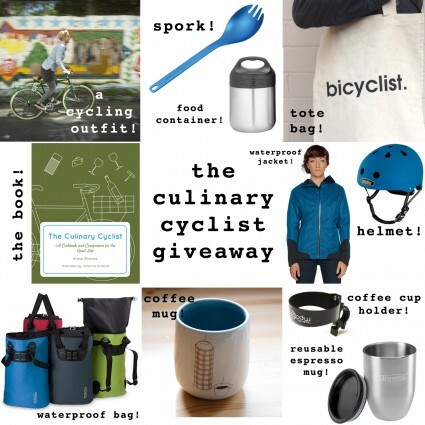 – The Bicyclist tote bag from AllthatIwant, which you can of course use to carry your copies of The Culinary Cyclist around town. This Official Culinary Cyclist Gift Pack is valued at over $500. Ready to enter? Just sign up for the Foodie Underground email. Type in your address below and hit the grey “subscribe” button to enter! Contest ends August 31, 2013. Colors may vary. As much as we would like to, international shipping is expensive, so we can only send this gift pack to a US address. Feel free to enter if you live abroad, but make sure you have a friend in the States that can accept your gift for you (and won’t take it for themselves!). Email addresses may be shared with participating partners. so don’t be surprised if you hear from them! So excited for you!! Congratulations again!! And what an amazing goodie package / celebration this is! Subscribed, sealed and entered! What an amazing giveaway! And congratulations on the new book. Can’t wait to check it out. Your CommentsYAY! One of our fav sites and one of our fav writers! So, this contest ends on August 31, which happens to be my birthday! Good luck, everyone!